You may have been subjected to a personality test at some point in your adult life – Meyers-Briggs Type Indicator (MBTI), Strengths Finder – there are oh so many to choose from. If you have it’s likely it was a Meyers-Briggs Type Indicator was which I have written about before. 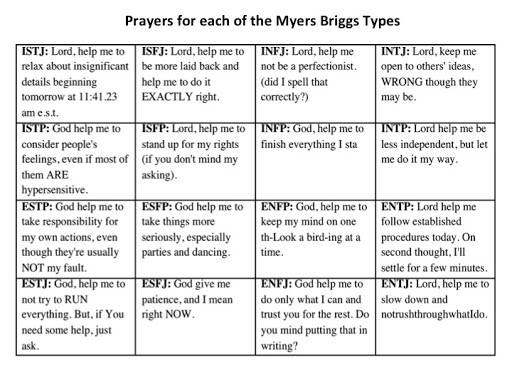 If you have your type memorized (I am either ENTJ or ESTJ depending on the day), you can indulge in the humor of the Prayer Grid below. It is so hard to get out of our boxes. That is one of my goals this year, to at least climb into or try on some new boxes. Recommendations?